I was told, from someone who is involved in the "prototype" project that the engine in that car is a replica from Wheatcroft, also the backaxle. But they have an original engine that actually will be rebuild. And, for me a big surprize and also dubious, that engine shall be a car engine and not a railway engine. Maybe the one out of the accident. Because of the chassis, he told me the Harrah story and the front axle is the one out of the accident that was found bend together with the chassis and had been straightened by the current restaurers. The problem here is that the owner of the "Prototype" bought the chassis from america WHERE IT HAD BEEN ALREADY STRAIGHTENED.As far as I know [and I have asked] he has no photos of the chassis before it was straightened in america.Maybe no photos exist.The chassis had to be straightened again in holland before it could be used.The owner is a perfectionist and the previous work was apparently unacceptable to him. That makes sense. And the pictures shown by Uwe (many thanks, Uwe) make believable the story. 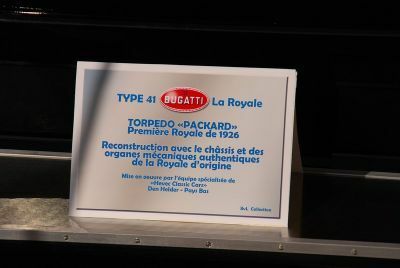 Then, the car would not be a replica, but the real 41100 prototype chassis. Maybe it had been better to keep the chassis as it was repaired in America, showing still the traces of the collision and giving authenticity to the car. If the owner also bought the remaining parts of Tom Wheatcroft's projects (two chassis and engines and a Coupe Napoleon body) plus the American speed record "50B/41", he can build other three complete cars as perfect as he wishes. It is not so strange that the owner has an original Royale car engine: The first autorails were fitted with the car engines which had remained unsold, being double ignition engines with one of each pair of holes for the spark plugs blanked off to be used in the autorails. Some of these first engines can have survived. The Schlumpf brothers missed many things for several reasons. Some times they wanted to pay too low prices; other times the owners did not wish to deal with them. The Bugatti T57 G owned by the Simeone Museum was for many years at the "museum" of the factory and the Schlumpf brothers missed it. The Royale Kellner and the Berline de Voyage were sold in the early fifties to Briggs Cunningham for a ridiculous price; another great chance missed by the Schlumpf brothers... They did not manage to buy everything. If so, how did things end up in the USA. Together with the 2 Royales? 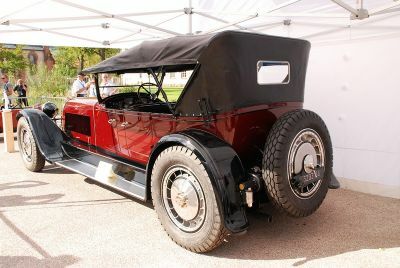 According to the stories told in this forum, the prototype chassis appeared when it was being used as a carriage in a farm. Afterwards, it was in the possesion of De Dobbeleer who in 1960 offered it for sale in the USA through Gene Cesari. 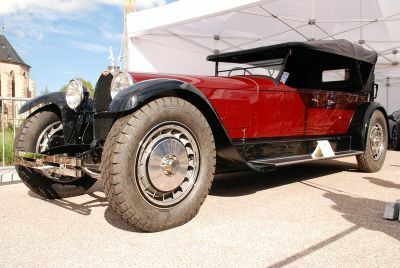 The chassis was bought by Bill Harrah, who sold it to another American collector who made some reparations which can be seen in Uwe's pictures but kept the chassis unfinished. Nothing to do with the couple of Royales which went to America after being bought by Briggs Cunningham in 1950. Last edited by LANOS on Thu Oct 06, 2011 12:13 pm, edited 1 time in total. Last edited by Uwe on Thu Oct 06, 2011 12:10 pm, edited 1 time in total. Great pictures Uwe, but no confirmation of the factory....That's the problem. For the most people of Molsheim it is a replica. They are from the article about the Torpedo.